Antitumor antibiotics have been discovered by screening of microbial culture filtrates for activity to inhibit experimental animal tumors which can be conveniently utilized. 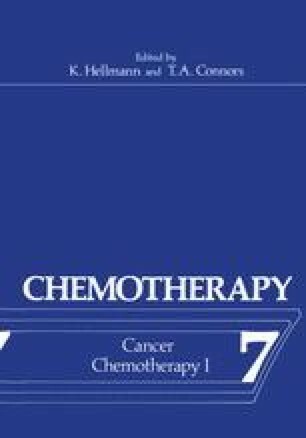 However, there is no direct relationship between a particular type of human tumor and such experimental animal tumors, and all antitumor antibiotics thus found exhibit cytotoxic action. Methods of testing activity against animal tumors, methods of testing cytotoxic action against cancer cells in culture or in disc plate agar (1), methods of testing mutagenic action, for instance, testing activity to cause induction of lyzogenic phage (2) or to cause mutation of T2 phage from h+ to h (3), have been devised. Biochemical methods (4) to test activity of culture filtrates to inhibit synthesis of protein, RNA and DNA in cancer cell homogenates were also presented.